"This is a very hearty dish, ideal for a winter dinner. Serve with just the potatoes, or add your favorite veggies: they will taste great with the dried mushroom sauce!" In a small bowl, soak dried mushrooms in hot water. Heat butter and 2 tablespoons olive oil in a skillet over medium heat. Stir in the onion and garlic; cook until the onion is tender and transparent. Stir in beef bouillon cube, and pour in mushrooms with water. Season with salt and pepper. Mix in cream; simmer gently for 5 minutes. Set aside. Place whole potatoes in a pan with water to cover; bring to a boil over high heat, and cook about 5 minutes. Drain water. When potatoes are cool enough to touch, cut them in half. Heat 2 tablespoons olive oil in a skillet over medium heat, and fry potatoes until golden. Season with salt and thyme. Set aside. Season beef medallions with salt and pepper. Heat 2 tablespoons olive oil in a wok or large skillet over high heat. Place medallions in hot oil, and brown on both sides. Remove from heat, and place medallions in the center of a roasting dish. Cover medallions with porcini sauce. Arrange potatoes around medallions. Cover dish with aluminum foil. Roast for 15 minutes. I made this dish for Christmas Eve last year. The flavor was spectacular, but I will include some type of thickening agent next time as the sauce is on the thin side. I guess I was expecting more from this dish. My husband and I are constantly trying to out do each other in the kitchen and this just didn't cut the 5 star quality that I was looking for. It took a bite of work but it was one of the best beef dishes we have ever made. I substitued fresh chanterelle mushrooms and the flavor was incredible. Also, I used Elk tenderloin, which, in my opinion, is far superior to beef. 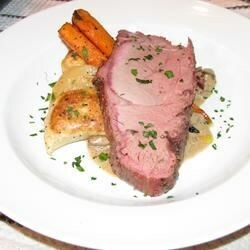 I thought this meal was REALLY good, simple, easy to follow, and worthy of beef tenderloin. LOVE the 'shrooms! Thanks for sharing such a delicious and simple recipe!